Join us on our First Friday Green Tours! On our walking tours, you can see campus sustainability projects in person and experience them first hand! During the academic year, the tours meet on the first Friday of the month at noon in the Sustainability Hub, or by appointment. 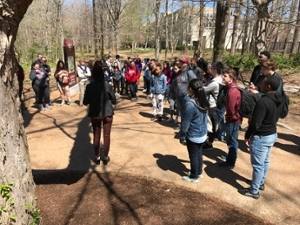 The typical walking tour covers about a dozen green funded projects, with stops along the way in the Student Center, Agriculture Building, and Faner Hall. However, tours can also be catered to specific interests! SIU currently has 169 Green Funded projects, totaling over $2.1 million dollars invested in sustainability! Please contact the Sustainability Office at sustainability@siu.edu or call 618-453-2786 if you are interested in coordinating or taking a tour in the future. Student Center – Home to the Sustainability Office and the Sustainability Hub, the Student Center has been an early advocate for sustainable practices, featuring water refilling stations, a solar powered trash can/compactor, a LED lighting project supported by the Green Fund, compostable food containers, ample recycling, and green meeting guidelines for events. Big Belly Solar Trash Compactors – There are four Big Belly Solar Trash Compactors on campus and in just six months they collected a quarter ton of trash waste and almost 200 lbs of bottles and cans. Bicycle Maintenance Repair Stations - Located at various spots across campus, the bicycle repair stations were installed through a partnership with the Department of Public Safety, Saluki Spokes, and the Sustainability Office. Each station features tools to help cyclists make basic bicycle repairs, from changing flats to adjusting brakes. Green Wall / Vertical Garden (Agriculture Building) - Through a collaboration with the Architecture Fine Arts Lecture Series and the College of Agricultural Sciences, Professor Karen Midden was able to invite artists Larent Corradi and Marie Steffanetti to SIU to construct a vertical garden. The vertical wall and design of the garden prevents water waste and special lights are used to simulate sunlight and provide energy for growth. The vertical garden is not only beautiful but it also works to purify the air. Elkay Refillable Water Stations - At least 30 water bottle refilling stations are installed across the Southern Illinois University Carbondale campus. Some of these refill stations have been funded by the Student Green Fee. Water refill stations continue to be added to campus locations as other water fountains become outdated. According to research, about three-fourths of all plastic water bottles end up in landfills, where they can take up to 450 years or more to degrade. These refillable water bottle stations encourage reusable bottles, eliminating unnecessary plastic waste. Want to see even more campus sustainability projects funded by the green fee? We offer virtual green tours that cover even more projects, including some listed below! Interested in a specific project? Ask us about it at sustainability@siu.edu! We will work to get the right information to you. To get a better idea of how projects are spread out around campus, you can browse our Green Tour map, created by Jennifer Haegele, of the Geospatial Resource Center in Morris Library. The map features just 21 of our more prominent Green Fund and sustainability projects. 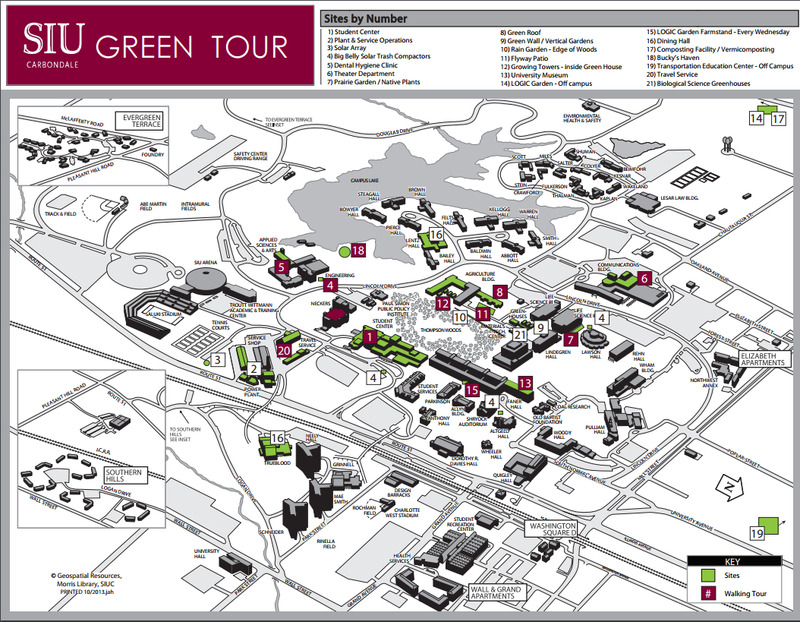 The numbers in maroon represent projects that can be featured on the Green Tour campus walk (please note that the numbers on the map do not correlate with the numbered projects above). Download the Full Green Tour Scheduled Dates, Walking Stops & Map!